This handmade victorian card was created and sent to me by Kim Lee Shaw from the United States. I know Kim quite a while. We got to know one another online and have been exchanging handmade cards with one another. Kim makes beautiful cards. I will upload some of her other cards that she sent me later. The image on the card was, I believe, from an image swap she had participated. If I'm not mistaken, this is one of the images sent to her by Karen Knegten, another mutual online friend. Look at the center of the silk flower. Kim pasted a tiny clock charm on it. Cool, right? Inside the card, Kim wrote, "Hi Flora, Hope you're having a wonderful day!" Thank you, Kim. Your card made my day wonderful. Thank you for allowing me to view it. It's nice to be able to see what others are doing with cards throughout the world. 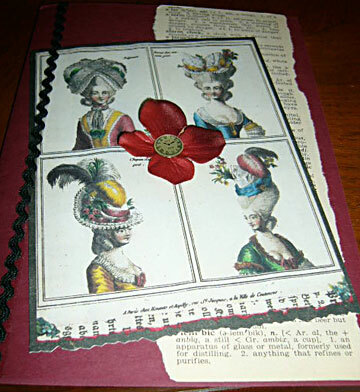 Computers are such a great invention for craft people; you can get so many ideas and a site such as Flora's gives us all the opportunity to share and view such lovely cards as Handmade Victorian Card. Join in and write your own page! It's easy to do. How? Simply click here to return to Handmade Greeting Cards Received.